With the news that the Irish Government will veto any deal that includes a hard border between the Republic and Northern Ireland, a long ignored (by the UK government and media) issue has finally exploded onto the front pages. It is a substantial problem not only in terms of Brexit negotiations but also in terms of historical and religious sensitivities. It would undo the great work of the Good Friday Agreement, dividing communities, families, businesses and friends. The solution now seems to be that Northern Ireland will retain regulatory convergence with the Republic in a number of areas, such as agriculture, and as such remain a de-facto member of the EU Customs Union. The DUP who seems deeply annoyed by the suggestion, which could spell trouble for the UK Government. However, it seems likely that the UK Government will agree to this, and that Wales will become the customs border between the island of Ireland and the UK mainland. Wales will be damaged economically if this occurs, as there is no way that Holyhead could be ready to shoulder such a burden. 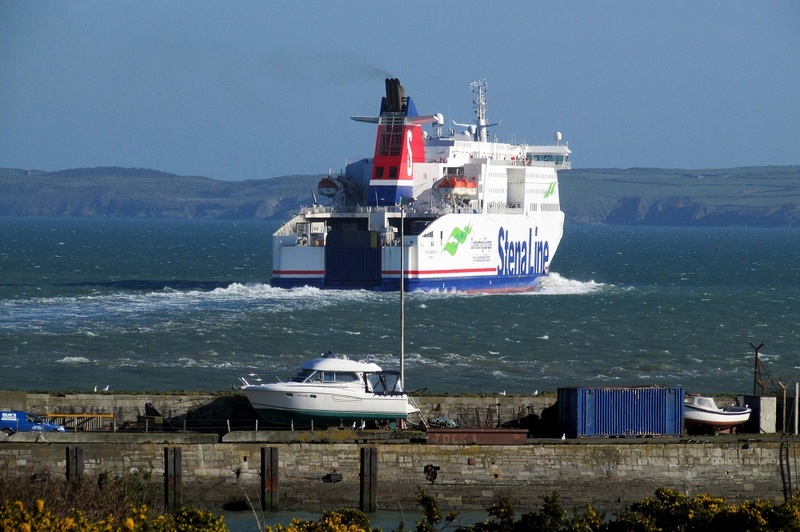 The port is ill-prepared for the intense customs checks that would be necessary to ensure regulatory compliance between goods produced on the island of Ireland and mainland Britain. The National Assembly’s External Affairs Committee found that should such a change as this occur lengthy delays and tailbacks on roads in north Wales would become the norm. Goods could be waiting for days at the port as presumably, it would operate as the gateway for goods both leaving and entering the UK. Irish ferries predict a ‘Hard Border’ in Wales would drastically cut the number of sailings per day between Holyhead and Ireland. 1000 people work at the Holyhead port. This would be disastrous for them and their families. The economic shock of such a move could be catastrophic. If Dover couldn’t cope with such a move, how can Holyhead? Already, ships are using Liverpool docks instead of Welsh ports. What happens when more complex regulatory regimes are in place? Even if the port could be prepared, the time is running out to ensure the customs infrastructure is in place for exit day. When David Davis said that Holyhead may have ‘an extra layer of complexity’ post-Brexit this is what he meant. This third-way position provides no clarity and is destined to fail and hurt people in the process. The rest of the UK will struggle to survive the economic shock, let alone Wales, let alone the port community of Holyhead. Also, if Northern Ireland remains part of the EU’s customs union, what happens to the sanctity of the UK’s internal single market? Whilst regulatory divergence is not necessarily an immediate consequence of the UK leaving the EU, it is inevitable. This is the reason that the UK Government refuses to devolve large swathes of powers back to the devolved administrations in areas that would otherwise be devolved, such as agriculture, fisheries, etc. There is a desire on behalf of the UK Government to ensure there is a common regulatory framework between the constituent parts of the UK to ensure that the UK Single Market remains whole. So that there is not a different regulatory arrangement for goods in Wales as there is in England, Scotland or Northern Ireland and that future trade deals can be negotiated on that basis. Whether these frameworks are created by Westminster or by the devolved administrations is important, but it does appear that they will exist. There will be a common regulatory arrangement between UK Nations. How can this be reconciled with the proposed situation in Northern Ireland? What happens to the Single Market of the UK when there is a regulatory divergence between Northern Ireland and mainland Britain? Northern Irish goods could be outside of our regulatory arrangements and vice-versa. If this were to occur the UK Single Market would collapse, potentially the UK with it. Or, in order to preserve the sanctity of the UK Single Market, the UK would be forced to legislate in-line with the EU and then you rightly question, what would have been the point of leaving in the first place? It’s unclear if this will even be possible once trade deals are signed and different regulatory regimes embarked upon. So, what is the answer? The only acceptable way forward should be that the UK remains part of the EU customs union. It ensures that there is no regulatory divergence between Ireland and Northern Ireland and as such ends the need for a border between the North and South if the common travel arrangement remains in place. Fortunately, there is already much agreement on that being the case. Unfortunately, as it is the obvious answer, in the eyes of the UK Government, it is wrong. Remaining in the EU’s customs union would prevent us from creating trade deals with our other ‘Global Partners’. Meaning that we wouldn’t be able to enjoy all that chlorinated chicken the Americans keep raving about. As such, we’re out. Any dissent on that matter will not be countenanced. It’s difficult to come to any conclusion based on the above other than that the UK Government must eventually change its mind and remain part of the EU Customs Union. Northern Ireland saying in the EU single market is a middle of the road idea at a time we must be decisive.